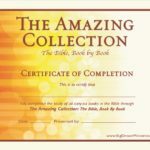 Request completion certificates at no charge for your class as they finish The Amazing Collection: The Bible, Book by Book or Be Amazing. Bravo! Be sure to include them as part of your book order to receive them right away. Otherwise please allow an additional 1-2 weeks for mail delivery. Or you can download them immediately from our Resources page.